Anyway, i don't know if you know me or my fan game, but i'm the Pokémon Chronicles fan game creator: Richard PT. The game recreates the old Pokémon games like: Pokémon Fire Red series + crystall + emerald, (gen 1 + 2 and 3 with stuff from gen. 4 and forth). At the moment the game has 4 regions for the public players to play. 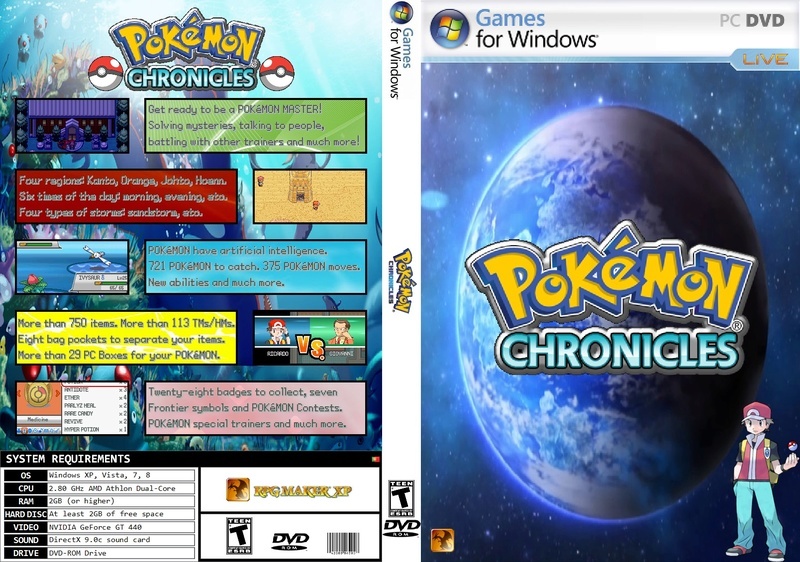 My Pokémon Chronicles uses the Pokémon Essentials starter kit v 17.2 for rpg maker xp. PS: Sorry for my bad english, its not my native language. Note: this is a free fan game. Project creator and leader: Richard PT. Graphics Designer: Richard PT, CharlieDawg. Other game stuff: Richard PT. Overworld Gen7 Pokemon spriters (few ones, not all): ??? Front battle trainer spriters (few ones): ??? Note: The sprites must be in fire red style or emerald style. I provide samples for you to complete them. Note: Your name will be displayed in game's final credits to credit you. Note: Or contact me through this forum or in the pokecommunity forum. (private messages of course) My nick is the same in all places. I edited the recruitment post for you to better understand what we still need for the game's project. bump... i'm still recruiting spriters. bump... i'm still recruiting spriters urgently. Hi, I have no experience with spriting but I'm pretty good at art so I think might be able to do it. Art like what, for example? Here, i will tell you what i need in terms of graphics: Overworld sprites for npcs, trainer battle sprites front or back, and facesets, i called them facesets (this term came from rpg maker editor), like the example below. Graphics must be static and fire red style, gen3. If you help me, i will provide you the materials, that way will be a little easy for you to understand better what to do. And credits will be given to you in my fangame final credits. Only few things are still needed to finish this huge project. I draw in a cartoonish anime style and have some experience with pixel art, I'm happy to help in any way I can. I already added some overworld sprites madded by you, credits will be given. Also, i'm the only one that asks you if you can do all the player heroes for all the official games, overworld sprites for bike, acro bike, surf, etc etc. For example: I'm using red and the girl from fire red, brendan and may from emerald, and i have jimmy = gold in my game, but i don't have all the sprites for crystal, silver is the rival. So, i was thinking on a new feature for the project, but i only add it if i have the sprites for: Crystal to finish the johto heroes, sinnoh heroes = i only have your walking sprites, Unova heroes, Kalos and this gen 8 heroes too. I was thinking on making them available in the gender selection screen where players can choose their favorites. And you can post them for the public if you want. The majority only have the fire red heroes sprites or emerald or only recolors of them, its so boring seeing and playing with the same chars, i guess. 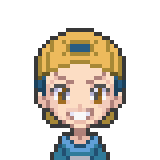 In my fangame, players can choose to be: Red, Jimmy= gold, Brendan, Ash kanto, Fire red girl, May, Ash Hoenn and Ash Unova. I see.... Bike fish run and surf is a heck of a lot of frames. Especially if it's done for each character. Have you tried to do it yourself by cutting and pasting the head on to the pre-existing templates and then recoloring the body as you need to? I do that kind of work for some of mine already madded. But i don't know if i can do it with yours. Someones are easy but other not for me. Some of them requires more than just the head part. Dive and surf, only have 4 diferent sprites, i can do the dive and maybe surf myself and i can share them with you as well. Fishing is the same sprites with the fishing + surfing sprites, Bicycle + mach bike are the same too, acro bike sprites is too much complicated for me, running sprites too. Then, i will search for front and back battle sprites + faces for text and i can make the map icons myself too. I'm not a spriter and i only do very small changes on sprites. At the moment i'm very busy in this month, i have lots of work and i'm doing my newest game update alone. It will be awsome if we do a full Protagonists sprites pack to share with other fangames. Yeah I hear you. I do this in my spare time. Which is very limited now that I'm back to work full time. If I have time I'll try to make a full set. That is my goal to have a choice for fan game creators. I can make walking front back and side Sprites very quickly. But the running the surfing and the biking are much more complicated. They require a lot of time. And I have two little kids who take up most of my time. Plus my wife would murder me if I spent too much time on the computer. I can help you with this matter by doing what i can. And we can do this when we've got time. I was searching for more content about this of the net and i've founded some stuff. This way we can reduce some work. I will post a package with all the stuff that are already done. And if possible we can ask for help on this matter too, i think. Yeah. I'm doing this for my fangame project and for those fangame devs that maybe want to have this as well, so it's free for those interested. Logically that i will make them like gen 3 graphics. 3 gen graphics for overworld are my favorite. Brings back memories as a kid playing on my Game Boy. Like you, all of my artwork is free for public use. A lot of people don't like to let you use their work and that was a big disappointment for me. So when I learned how to make my own art I made it a point to share all of it free for public. I agree. I have the same nostalgic thing like you. My fangame is a remake of all the gen 3 games: fire red + emerald. For johto, i remaked the crystal to make it compatible with gen 3 style. And i remake some events from yellow or other official games. Even the wild encounters and lvs are a mix of gen 1 + 2 and 3. If you played my fangame you will notice this things. I builded a fangame that has 4 entire regions for players to play. This project is at its final stage of development and it gives you lots of stuff that i added, to make it more "complete" with some stuff from further regions. I will post the sprites pack as soon as possible, and take your time to do the sprites.